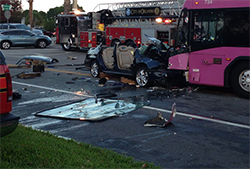 Lynx Bus Accident Attorney Orlando | David R. Heil P.A. If you or someone you love is the victim of a Lynx bus-related accident, you may be entitled to legal recourse to recover compensation for health or financial damages. Due to lessened safety measures compared to other motor vehicles, it is not uncommon for injuries sustained during significant Lynx bus-related accidents to be extreme. Life after a serious accident can be physically and emotionally challenging and navigating the legal process to obtain compensation can be frustrating. The window of time available to take legal action following a Lynx bus-related accident is minimal, especially with the convoluted process of filing claims against the government and commercially owned bus lines. It essential that your personal injury attorney in Orlando is experienced with the filing process specific to Lynx bus-related accidents within the state of Florida. Whether you are the victim of a Lynx bus-related accident resulting from negligence on the part of the Lynx bus operator or a driver of another motor vehicle, product or manufacturer liability, malicious intent or wrongful death you may be entitled to financial compensation for your injuries and damages. In developing a Lynx bus-related personal injury lawsuit, it is important to clearly determine liable participants and the exact cause of the accident. An understanding of case specifics is crucial to the outcome of your lawsuit and it is important to clearly know your legal rights. At the Orlando Law Offices of David Heil, our skilled attorneys have over 33 years of experience dealing with personal injury law and can assist you in recovering compensation for your Lynx bus-related accident. To speak with an Orlando personal injury attorney about your Lynx bus-related accident, please call us at (800) 952-1622 for a free consultation.